The 2006 Cleveland Browns season was the team's 58th season as a professional sports franchise and its 54th season as a member of the National Football League (NFL). It began with the team attempting to improve upon their win-loss record from 2005, where the team ended the year at 6–10. They were one of the most active teams during the free agency period, and looked to be one of the most improved teams of the season at the end of the NFL Draft. They experienced many setbacks during training camp, from which they never fully recovered. By the end of the season they had gone 4–12, losing two more games than the previous season. The Cleveland Browns' front office was busy during the first several days off the free-agent signing period, looking to help the team by signing players who they felt would make immediate impacts upon the team. On the first day, the Browns signed center LeCharles Bentley, wide receiver Joe Jurevicius, and offensive tackle Kevin Shaffer. Bentley and Shaffer were signed to help protect second-year quarterback Charlie Frye in the pocket, and Jurevicius was signed to provide veteran support to the Browns' young receiving corps, which then-consisted of Braylon Edwards, Josh Cribbs, and veteran Dennis Northcutt. On the second day of the free-agent period, the Browns signed punter Dave Zastudil to replace Kyle Richardson, and to establish a good punting game. An interesting fact about the Browns' free-agent signings deals with the fact that Bentley, Jurevicius, and Zastudil are each Ohio-natives, and expressed their wish to play for the Browns at some point in their careers. A day after signing Zastudil, the Browns signed veteran nose tackle Ted Washington in an attempt to improve the Browns' run defense. After signing Washington, the Browns made their final key free-agent signing, by inking a deal with linebacker Willie McGinest. McGinest was signed to provide veteran support among the Browns' linebacking corps, and brought back under the direction of head coach Romeo Crennel, who coached McGinest defensively through three Super Bowls while in New England. As the 2006 NFL Draft neared in late April, the Browns had already filled in many of their holes through free agency, and would primarily be looking for players who would help the 4–3 defense. The Browns had their eyes set on Haloti Ngata, who they would presumably build up to take over for Ted Washington. On the day of the draft, the Browns traded their 12th pick to the Baltimore Ravens for the 13th pick and a 6th round pick. Baltimore used the pick to take Ngata, while the Browns selected outside linebacker Kamerion Wimbley, the player who Cleveland GM Phil Savage had wanted the whole time. The selection of inside linebacker D'Qwell Jackson in the second round created a linebacker core of Andra Davis, Jackson, McGinest, and Wimbley. Wide receiver Travis Wilson was selected in the 3rd round as a developmental project and future possession receiver. On day two of the draft, seven other players were taken; linebacker Leon Williams, tackle Isaac Sowells, running back Jerome Harrison, cornerback DeMario Minter, fullback Lawrence Vickers, nose tackle Babatunde Oshinowo, and safety Justin Hamilton. Minter ended up being the only rookie not playing a down that season due to injury. The way the Browns handled the draft was mostly praised, filling in their voids and finding future starters in late rounds. During the 2006 off-season, the Cleveland Browns made two significant trades. Their first would be trading veteran quarterback Trent Dilfer to the San Francisco 49ers for fourth-year quarterback Ken Dorsey. The trade was an important step in solidifying second-year quarterback Charlie Frye as the Browns' starting quarterback heading into the 2006 regular season. The other important trade the Browns made would fill the void at center left by newly acquired free agent LeCharles Bentley. The Browns traded a conditional 2008 draft choice to the Philadelphia Eagles for center Hank Fraley. The Browns subsequently signed Fraley to a one-year contract. On July 27, the first day of the Cleveland Browns' training camp, free-agent center LeCharles Bentley suffered a season-ending knee injury during the first contact play of camp. Bentley was quoted as saying, "No one touched me. It was a freak thing. I took two steps, felt the injury and that was it. It felt like someone had kicked me." Bentley also said that he's "[...] never been a patient person", and that "[...] [l]earning to adjust my body and my limitations is going to be a difficult challenge. When it's all said and done, it's going to make me better." Bentley was expected to help protect second-year quarterback Charlie Frye. After news of Bentley's injuring, back-up center Bob Hallen left training camp, leaving the team without a center. On July 30, the Browns signed veteran center Todd Washington. On August 7, Washington announced his retirement. On August 12, Hallen announced his retirement, citing two herniated discs and stenosis as the reason for his retirement. The Browns faced even more problems when third-string center Alonzo Ephraim, who was signed following Bentley's injury, was suspended for substance abuse. August 17 saw the Browns center woes disparaging slightly, as they acquired Ross Tucker from the Patriots. On August 24, the Browns acquired center Lennie Friedman from the Chicago Bears for a conditional 2007 draft choice. On September 2, the Browns finally found what they had been looking for when they traded a conditional 2008 draft choice to the Philadelphia Eagles for center Hank Fraley. Upon signing Fraley, Ross Tucker's contract was terminated. The Cleveland Browns started off with a 20–7 loss to the Philadelphia Eagles. Next, they managed to get their first preseason win at home 20–16 against the Detroit Lions. They then won their first preseason away game 20–17 against the Buffalo Bills, before losing their final preseason game at home against the Chicago Bears 20–7. The Cleveland Browns came out of their pre-season with a record of 2–2. Their performance during the pre-season showed promise for the team heading into the regular season. On the first play from scrimmage, quarterback Charlie Frye completed a 74-yard touchdown pass to wide receiver Braylon Edwards. However, because of a holding penalty on tackle Kevin Shaffer, the play was called back. The Browns would only manage 56 yards of total offense during the first half of play. By halftime, New Orleans was leading the game 9–0, because of three field goals (43 yards in the first quarter, 25 and 21 yards in the second) by kicker John Carney. In the second half, Frye completed an 18-yard touchdown pass to tight end Kellen Winslow, marking his first career touchdown reception. However, the Saints burgeoned their lead, with opposing quarterback Drew Brees completing a 12-yard touchdown pass to wide receiver Marques Colston. In the fourth quarter, Frye brought the Browns within two points of the lead when he rushed for a 1-yard touchdown. A 20-yard field goal from Carney put the Saints up for good, 19–14. The Browns were threatening in Saints territory as the clock was winding down, but a Frye pass deflected off Edwards' chest and into the hands of safety Josh Bullocks. With the loss the Browns began their season 0–1. 0–1 against NFC opponents. The Browns traveled to Cincinnati for their week two match-up against the Cincinnati Bengals at Paul Brown Stadium. The Browns offense struggled for the second straight week, turning in only 56 rushing yards. Despite Charlie Frye passing for 244 yards, he threw no touchdowns and two interceptions. The Bengals scored three times in the first half. Wide receiver Kelley Washington caught a 22-yard touchdown pass from quarterback Carson Palmer, and wide receiver Chad Johnson caught an 8-yard touchdown pass from Palmer, in the first quarter. Kicker Shayne Graham added three more points in the second quarter with a 37-yard field goal. Phil Dawson put the Browns' only points on the board in the first quarter with a 30-yard field goal. The second half was slightly better for the Browns, with their defense holding the Bengals scoreless in the third quarter. After a field goal from 37 yards by Graham in the fourth quarter, the Browns capped off a 76-yard drive with Reuben Droughns' first rushing touchdown of the season. The Browns had excellent field position for that drive because of a 75-yard pass from Frye to Braylon Edwards. Running back Rudi Johnson then scored two touchdowns from 1 yard and 9 yards out. Charlie Frye put the Browns' final points on the board when he ran in from two yards out for the score. In the end though, the Browns would end up losing Round 1 of 2006's Battle for Ohio while dropping to 0–2. 0–1 against division rivals and 0–1 in conference games. The Browns returned home, still searching for their first win of the year, with a Week 3 division battle, against the Baltimore Ravens. The Ravens drew first blood in the first quarter, as kicker Matt Stover kicked a 32-yard field goal for the only score of the quarter. In the second quarter, the Browns came to life, as QB Charlie Frye completed a 58-yard TD pass to WR Braylon Edwards and Frye managed to get a TD on a 1-yard TD run. After a scoreless third quarter, it seemed that Cleveland would finally get its first victory, but in the fourth quarter, the Ravens managed to fly back into the game. QB Steve McNair would complete a 3-yard TD pass to TE Todd Heap. Finally, Stover would help Baltimore steal one from the Browns, with a 43-yard and a 52-yard field goal. With their last-second loss, the Browns fell to 0–3. 0–2 against division rivals and 0–2 in conference games. The Browns flew to McAfee Coliseum to take on the Oakland Raiders, still hoping for their first win of the year. From the get-go, things immediately got ugly, as RB Reuben Droughns fumbled and LB Sam Williams picked up the ball for a 30-yard return touchdown. In the second quarter, the Browns' woes continued, as QB Andrew Walter completed a 5-yard TD pass to WR Randy Moss. Cleveland would get a 28-yard field goal by kicker Phil Dawson, but Oakland continued to pour on the hurt as RB LaMont Jordan ran 59 yards for a touchdown. The Browns would get a touchdown before halftime, as QB Charlie Frye completed a 3-yard TD pass to TE Darnell Dinkins. In the third quarter, Cleveland finally managed to click on all cylinders, as Frye completed two more TD passes to TE Kellen Winslow (a 2-yard pass) and WR Joe Jurevicius (a 5-yard pass) to take the lead. Afterward, the Browns held on for the rest of the game to finally get their first win of the year causing them to improve to 1–3. 1–2 in conference games. Hoping to build on their win in Oakland, the Browns flew to Bank of America Stadium for a Week 5 match-up with the Carolina Panthers. The Browns would score first, as kicker Phil Dawson got a 41-yard field goal, but the Panthers did better, as CB Richard Marshall intercepted a pass that bounced off WR Dennis Northcutt's hands and returned it 30 yards for a touchdown. In the second quarter, Cleveland's struggles continued as Panthers QB Jake Delhomme completed a 17-yard TD pass to WR Keyshawn Johnson for the only score of the second period. Johnson was being covered by safety Brodney Pool, who was forced to play cornerback due to injuries to Gary Baxter and Leigh Bodden. In the third quarter, both sides would get field goals, as Carolina kicker John Kasay kicked a 22-yarder, while Dawson made a 47-yard field goal. In the fourth quarter, the Browns got closer with Dawson's 22-yard field goal, but the Panthers managed to put the game away, as Kasay got a 19-yard field goal and gave the Panthers a huge lead. Even though Dawson would make a 32-yard field goal, Cleveland's struggles continued to hurt them, as they went into their bye week at 1–4. 0–2 against NFC opponents. Coming off their bye week, the Browns headed back home to Cleveland Browns Stadium for a rendezvous with their old rival, the Denver Broncos. The Broncos' Jason Elam kicked a 32-yard field goal early in the second quarter for a 3–0 lead. Then, right after the two-minute warning, Tatum Bell rushed to the right for a 9-yard touchdown run. The halftime score was 10–0. In the first half, the Browns offense earned just four first downs, scored no points, and Charlie Frye was sacked three times. With 9:13 remaining in the third quarter, Jake Plummer connected with rookie Brandon Marshall for a nine-yard touchdown to make the score 17–0. After Champ Bailey intercepted Charlie Frye in the fourth quarter, Andra Davis returned the favor by intercepting Jake Plummer and set the Browns offense up at the Denver 18. Two short plays later, Frye passed to Joe Jurevicius for a 6-yard touchdown catch. It was only the second touchdown allowed by Denver's defense all season and it was the first 4th-quarter touchdown of Charlie Frye's career. However, Cleveland's last two possessions did not result in a comeback. Denver held on for a 17–7 victory. Two days after the game, Offensive Coordinator Maurice Carthon resigned. With the loss, the Browns fell to 1–5. 1–3 in conference games. The Browns entered week 8 against the New York Jets with Jeff Davidson taking over for Carthon as offensive coordinator. An 8-minute opening drive by the Jets would result in a Mike Nugent 27-yard field goal, which the Browns matched with a Phil Dawson 47-yard kick. In the 2nd quarter, an interception by the Browns' Sean Jones set up a 2-yard touchdown run by Reuben Droughns. The Browns failed to score on a deep drive at the end of the half, with Dawson missing a 26-yard field goal try,and the teams headed into the break at 10–3. The Browns opened the third quarter with a 57-yard drive capped by a Kellen Winslow touchdown reception for 30 yards. Later in the quarter, a Leon Washington fumble led to another field goal for the Browns. Justin Miller would answer back, however, by taking the ensuing kickoff 99 yards for a touchdown. After a Browns punt, the Jets moved down the field and got a 47-yard field goal from Nugent. The Browns offense stalled out in the fourth quarter, but the defense played well. Sean Jones got another interception midway through the fourth quarter, and a late drive by the Jets failed as Chad Pennington's final throw to the endzone was caught by Chris Baker; however, the officials ruled that he would have landed out of bounds even if the Browns' Brodney Pool hadn't pushed him. The play was not reviewed even after the Jets called a time-out for the booth official to think it over, and the Browns hung on to win. With the win, the Browns improved to 2–5. Hoping to build on their home win over the Jets, the Browns flew to Qualcomm Stadium to take on the throwback-clad San Diego Chargers. In the first quarter, things started off close with Chargers kicker Nate Kaeding getting a 29-yard field goal, while Browns kicker Phil Dawson nailed a 37-yarder. In the second quarter, Dawson would get a 20-yard field goal for Cleveland. However, San Diego got the first touchdown of the game, as LB Marques Harris recovered a fumble in the Browns endzone for a touchdown. Dawson would supply the scoring for Cleveland for the rest of the half, as he nailed a 42-yarder and a 30-yarder. In the third quarter, the Chargers gained some momentum, as RB LaDainian Tomlinson, after getting bottled up in the first half, broke out with a 41-yard TD run for the only score of the period. In the fourth quarter, Dawson would get another field goal, which came from 36 yards out. However, San Diego would respond with Tomlinson getting a 7-yard TD run. Cleveland would have Dawson get a 35-yard field goal, yet Tomlinson would get an 8-yard TD run, which was followed by a successful two-point conversion from QB Philip Rivers to WR Vincent Jackson. The Browns would finally get a touchdown, as QB Charlie Frye completed a 4-yard TD pass to WR Braylon Edwards. Unfortunately, the damage was already done. With the loss, Cleveland would fall to 2–6. Very little happened in the third quarter. Michael Vick was driving in Cleveland territory with 5:28 remaining when he was intercepted again by Browns safety Brodney Pool. However, the ensuing Browns possession resulted in a Dave Zastudil punt. The punt was out of their own endzone and was returned to the Browns 12. It took two plays for Vick to connect with wide receiver Michael Jenkins for a touchdown. The score was then 14–10. The possibility of success seemed unlikely for the Browns in the fourth quarter. After the teams each went three and out, Atlanta gained favorable field position and were able to bring Andersen in for a 46-yard field goal. At that point the Browns were leading 14–13. The next drive for the Browns looked promising. After two passes to tight end Steve Heiden and a 36-yard pass to Kellen Winslow, the Browns then faltered and had to settle for a 43-yard Phil Dawson field goal. The score was 17–13. With 3:18 remaining in the game, Atlanta took over on their own 28-yard line. Down by 4, Vick let in loose downfield to an open receiver Roddy White for a 55-yard gain. The Falcons then committed a 10-yard penalty and Vick threw an incomplete pass. With 2nd and 20 on the Cleveland 27, Vick fumbled the ball on 3rd down to a waiting Browns rookie cornerback Jereme Perry. Out of timeouts, the Falcons fell for a second week in a row to the Browns. Hoping to build on their road win over the Falcons, the Browns returned home for Round 1 of their rust belt battle with the Pittsburgh Steelers. After a scoreless first quarter, the Browns struck first as CB Daven Holly returned an interception 57 yards for a touchdown. Later, kicker Phil Dawson completed a 23-yard field goal. In the third quarter, Steelers kicker Jeff Reed completed a 43-yard field goal for the only score of the period. In the fourth quarter, the true nature of the rivalry would commence. Dawson would give Cleveland a 35-yard field goal, but Pittsburgh responded with QB Ben Roethlisberger completing a 20-yard TD pass to rookie WR Santonio Holmes. WR Josh Cribbs would return a kick off 92 yards for a touchdown to give the Browns a 20–10 lead. However, the Steelers would take the lead with RB Willie Parker getting a 1-yard TD run and a 4-yard TD reception. The Browns final drive of the game almost came up successful, but QB Charlie Frye's 22-yard pass to WR Braylon Edwards fell incomplete. With the loss, Cleveland fell to last place in the AFC North at 3–7. Coming off a devastating home loss to the Pittsburgh Steelers, the Browns stayed at home as they faced the Cincinnati Bengals in Round 2 of the Battle of Ohio. However, this match-up would find Cleveland not scoring a single point all game. In the first quarter, Bengals RB Rudi Johnson got a 1-yard TD run for the only score of the period. In the second quarter, QB Carson Palmer completed a 7-yard TD pass to WR Chris Henry, while kicker Shayne Graham got a 24-yard field goal for another uncontested 10 points. In the third quarter, Palmer would hook up with WR T. J. Houshmandzadeh on a 6-yard TD pass (along with a failed PAT) for the only score of the period. In the fourth, Palmer and Henry wrapped up the game on a 10-yard TD pass, shutting out the Cleveland Browns on their home field, 30–0. With the second loss in a row at their home stadium, the Browns fell to 3–8. Braylon Edwards was involved in a highly publicized altercation with Charlie Frye on the sideline during the game, resulting in Edwards issuing a formal apology for his actions. The Browns came into the game hoping to rebound from the humiliating loss to the Bengals. They came out strong, striking first with a touchdown pass from Frye to Braylon Edwards, and an impressive defensive stop. The Chiefs responded, however, and Trent Green tied the game up 7–7 on a 22-yard pass to Eddie Kennison. They scored again 8 minutes later, this time a 9-yard TD pass to Tony Gonzalez. The Browns fought back, and just before halftime, Droughns ran 1 yard into the endzone, to tie it up at 14 going into halftime. Starting QB Charlie Frye was injured in the first half and, despite attempting a return, came out in the third quarter with a brace on his wrist and no shoulder pads. Derek Anderson took over the game for the Browns. The second half started out poorly, as Kansas City scored two more touchdowns on passes to Kris Wilson and Tony Gonzalez. The Browns came back to life in the final 9 minutes, with two touchdown passes from Anderson to Steve Heiden, one with 30 seconds left on the clock. In overtime, the Chiefs won the toss, but the stingy Browns defense forced a punt. A key pass from Anderson to Winslow moved the ball up, and Anderson came back out and ran for a large 33-yard gain, bringing the ball inside the 20-yard line. (It was the longest run from scrimmage for the Browns so far during the season.) Dawson sealed the deal with a 33-yard field goal to win the game. Coming off a surprising upset over the Chiefs, the Browns flew to Heinz Field for Round 2 of the Rustbelt Rivalry with the Pittsburgh Steelers on Thursday night. In the first quarter, Cleveland trailed as QB Ben Roethlisberger completed a 49-yard TD pass to WR Nate Washington for the only score of the period. In the second quarter, the Browns trailed even further as kicker Jeff Reed nailed a 23-yard field goal for the only score of the period. In the third quarter, Cleveland's ineffectiveness against Pittsburgh continued as Roethlisberger scored a touchdown on a 2-yard QB sneak, while RB Willie Parker got a 3-yard TD run. In the fourth quarter, Reed managed to put the game well out the Browns' reach with a 28-yard field goal. 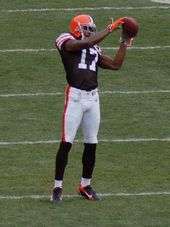 Cleveland would score a touchdown as QB Derek Anderson completed a 45-TD pass to WR Braylon Edwards, yet it would be their only score and their only highlight of the game, as the receiving corps had many dropped passes. With another sweep by the Steelers, the Browns fell to 4–9. Following their road loss to the Steelers, the Browns flew to M&T Bank Stadium for an AFC North rematch with the Baltimore Ravens. In the first quarter, Cleveland led early with kicker Phil Dawson getting a 51-yard field goal. However, the Ravens took the lead with RB Jamal Lewis getting a 7-yard TD run. In the second quarter, Kyle Boller took over at QB for the Ravens after starting QB Steve McNair went out with a hand injury. Baltimore's lead increased when Boller completed 9-yard TD pass to FB Ovie Mughelli and kicker Matt Stover completed a 38-yard field goal. However, the Browns showed signs of life as QB Derek Anderson completed a 3-yard TD pass to WR Joe Jurevicius. In the third quarter, Cleveland tied the game at 17–17 with Anderson's 14-yard TD pass to WR Braylon Edwards. However, the Ravens took over for the rest of the game with Boller's 77-yard TD pass to WR Demetrius Williams. In the fourth quarter, Baltimore wrapped the game up with Stover's 22-yard field goal. With the loss, the Browns fell 4–10. For the first time in the history of the Cleveland Browns, the team did not win a game in their own division. Trying to snap a two-game losing skid, the Browns played their final home game of the year in a Week 16 interconference fight with the Tampa Bay Buccaneers. In the first half, Cleveland trailed as Buccaneers' kicker Matt Bryant kicked a 23-yard field goal in the first quarter and a 24-yard field goal in the second quarter. In the third quarter, Tampa Bay continued its pounding with RB Michael Pittman's 11-yard TD run (with the following PAT being blocked). In the fourth quarter, the Buccaneers further increased their lead with OLB Derrick Brooks returning an interception 21 yards for a touchdown. Afterward, the Browns got their only score of the game with CB Daven Holly returning a fumble 40 yards for a touchdown. Then, the Buccaners wrapped up the game with Bryant kicking a 37-yard field goal. With the loss, Cleveland fell to 4–11. Trying to end their season on a high note, the Browns flew to Reliant Stadium for the third-straight year to take on the Houston Texans. Charlie Frye convinced Coach Crennel to allow him to start despite having a deep bone bruise in his wrist. After a scoreless first quarter, the Browns struck first with kicker Phil Dawson getting a 43-yard field goal for the only score of the period. However, in the third quarter, Cleveland's ineffectiveness continued to show as Texans RB Chris Taylor got a 5-yard TD run, while DT Anthony Maddox returned a fumble 47 yards for a touchdown. In the fourth quarter, the only thing that the Browns could muster was Dawson's 36-yard field goal. With four-straight losses to end the season, Cleveland ended its season at 4–12. The Browns season ended with 12 players in the Injured Reserve list, many of them starters. 1 2 "Browns buy a Bentley, sign Jurevicius, Shaffer". Archived from the original on 2006-12-14. Retrieved 2007-01-20. ↑ "Browns stay close to home, sign Zastudil". Archived from the original on 2006-12-13. Retrieved 2007-01-20. ↑ "Browns sign veteran run-stuffer Washington". Archived from the original on 2006-12-13. Retrieved 2007-01-20. ↑ "McGinest reunites with Crennel in Cleveland". Archived from the original on 2006-12-15. Retrieved 2007-01-20. ↑ "Ravens land Ngata". Archived from the original on 30 December 2006. Retrieved 2007-01-20. ↑ "The Browns Grab a Receiver". Retrieved 2007-01-20. ↑ "Team Grades for 2006 NFL Draft". Retrieved 2007-01-20. ↑ "Cleveland Browns '06 Draft Review". Archived from the original on 2006-11-22. Retrieved 2007-01-20. ↑ "Browns trade Dilfer to Niners for Dorsey, draft pick". Retrieved 2007-02-25. ↑ "Browns center Bentley out for season with torn tendon". Archived from the original on 23 August 2006. Retrieved 2006-09-20. ↑ "Browns Bentley vows to come back better than ever". Retrieved 2006-09-20. ↑ "Browns C Hallen retires". Retrieved 2006-09-20. ↑ "Browns center Ephraim suspended four games". Archived from the original on 21 August 2006. Retrieved 2006-09-20. ↑ "Finding a center no snap for Browns". Retrieved 2006-09-20. ↑ "Browns acquire center from Bears". Retrieved 2006-09-20. ↑ "Browns waive Suggs, acquire center from Philadelphia". Retrieved 2006-09-20. ↑ "Cleveland @ Philadelphia GameCenter". Archived from the original on 2007-02-23. Retrieved 2007-03-18. ↑ "Detroit @ Cleveland GameCenter". Archived from the original on 2007-02-18. Retrieved 2007-03-18. ↑ "Cleveland @ Buffalo GameCenter". Archived from the original on 2007-01-02. Retrieved 2007-03-18. ↑ "Chicago @ Cleveland GameCenter". Archived from the original on 2007-02-20. Retrieved 2007-03-18. 1 2 "Gamecenter:Play-by-Play". Archived from the original on 2007-02-18. Retrieved 2007-02-25. 1 2 "Gamecenter: Game Stats". Archived from the original on 2007-02-19. Retrieved 2007-02-25.